Undercoating and rust proofing are two incredibly valuable services that should be done to your vehicle on regular basis. Whether your vehicle is old or new, these services can be essential to preserving the value and performance of your vehicle. It is important to know what these services entail, so you can be aware of what is specifically needed for your car. So, are rust proofing and undercoating the same thing? No, they are not. Rust proofing and undercoating are two separate endeavors. What’s the difference between rust proofing and undercoating? The main distinction between undercoating and rust proofing is the part of the car that is being targeted for protection. Rust proofing is aimed at providing protection for the body of your automobile. Undercoating is employed to protect the frame of your vehicle. Both are encouraged and highly recommended for safeguarding your vehicle against the damaging environmental elements. First, we will examine what rust proofing is and how it can benefit your vehicle. Rust proofing is designed to protect the body of your vehicle from rust and corrosion. This includes all the metal components. Rust is a very tricky adversary to combat. It can hide and lay dormant in those hard to reach and difficult to spot areas in your vehicle. It can be eating away at the very structure of your car without you even realizing it. I’m sure you have witnessed an old rusted out car on the side of the road or in a junk yard. Vehicles that have been completely consumed by rust. In some cases, the vehicle is barely even recognizable anymore, with not even an inch of the original paint job to help identify it. Obviously, a vehicle of this description is too far gone, and past the point of no return. Don’t let your car get to that point, prevention is the best way to fight rust and corrosion. Having rust proofing services applied to your vehicle consistently can help bring peace of mind and avoid you shopping for a new vehicle before it is necessary. 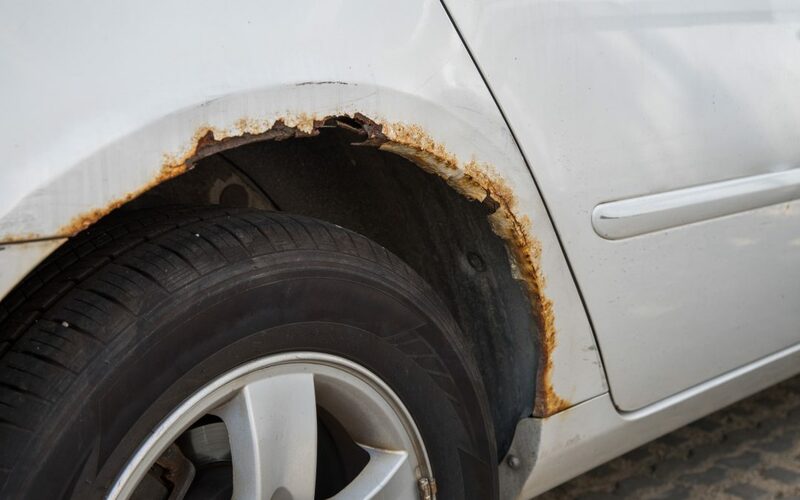 Rust proofing can help you avoid a situation where you find that your car has been infiltrated by rust and has been destroying from the inside out over the past several years. Undercoating involves a layer of protective spray being applied to the undercarriage of your vehicle. This covers the entire underside of your car, including the floor boards and wheel wells. The undercarriage of your vehicle is exposed to all kinds of hazards that could trigger the formation of rust and corrosion. Especially in Ontario, where drivers experience extreme weather conditions. The conditions in winter opens your car to an assault from ice, snow, sand and salt. This salt can work its way into those hard to reach places and then begin to form rust. It is important to have the undercarriage of your vehicle thoroughly cleaned before applying an undercoating, or your will just be sealing in unwanted and potentially harmful elements that may accelerate the formation of rust rather than preventing it. If you are looking for comprehensive rust protection in the Brampton area, Valvoline Express Care is an ideal choice. The expert technicians at Valvoline can provide both rust proofing and undercoating services, that are top quality and affordable.